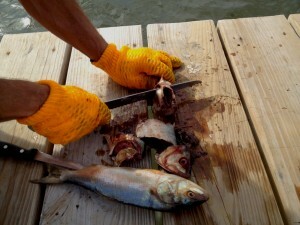 In Chincoteague this week, it’s a perfect time to do some crabbing. These bunker baited our large crab pots, three of which we dropped off the end of our pier. The next day, we had 20 large crabs for a super feast. Old Bay, beer, and fries from Capt Zachs round it out.